This Cabbage and Crunchy Noodle Salad with an Oriental Style Dressing is a much-loved Aussie dish. It’s a real crowd pleaser and perfect for sharing at BBQs and potlucks. Australian’s have quite an eclectic palate. Our cuisine is ever-changing and increasingly influenced by our multiculturalism. We love our spaghetti bolognese (or spag bol), fried rice, curries and sushi. But it’s the more offbeat foods that are ubiquitous in our kitchens that I’d like to introduce you to today. Fairy bread is one. This delicacy is essentially just white bread, butter and sprinkles (or 100s and 1000s as we call them) cut into small triangles and is generally served at children’s birthday parties. Its nutritional value is questionable at best, but it’s extremely irresistible. Zucchini Slice – a crustless quiche – is another beloved Aussie recipe that is commonly found packed in lunchboxes or on a share plate at office morning teas. It’s perfect as is, but lends itself well to additions like ham, bacon or capsicum. And then there’s this Cabbage and Crunchy Noodle Salad, or “Chang’s Crispy Noodle Salad” as it’s more commonly referred to. “Chang’s” is the brand that makes the crunchy noodles, and they have the original recipe for this salad printed on the back of their packets. This salad is the kind of powerhouse that goes with everything and appeals to the masses. Whether it’s on the table at a summer BBQ or Christmas lunch, it fits right in. Not to mention how easy it is to prepare! It may seem like an odd combination but it just works. And considering it’s one of my all-time favourite side dishes, I just had to share it on the blog so you dear reader can try it too. 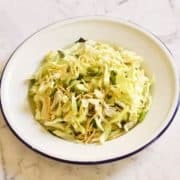 I’m sure this Cabbage and Crunchy Noodle Salad is bound to become a favourite in your family, and you can enjoy a little taste of Australia in every bite. What food or dish comes to mind when you think of Australia? Let me know in a comment below. Crispy Noodles – If you can’t get your hands on a packet of Chang’s Fried Noodles, substitute for uncooked ramen. Caster Sugar – I’ve discovered caster sugar isn’t commonly found in the US. You can use granulated sugar as a substitute, or make your own. Nuts – I love this salad with pepitas but you could easily substitute for slivered almonds or pine nuts. Make Ahead – If you’re planning on taking this salad to a party, leave the noodles and dressing out and mix together just before serving. 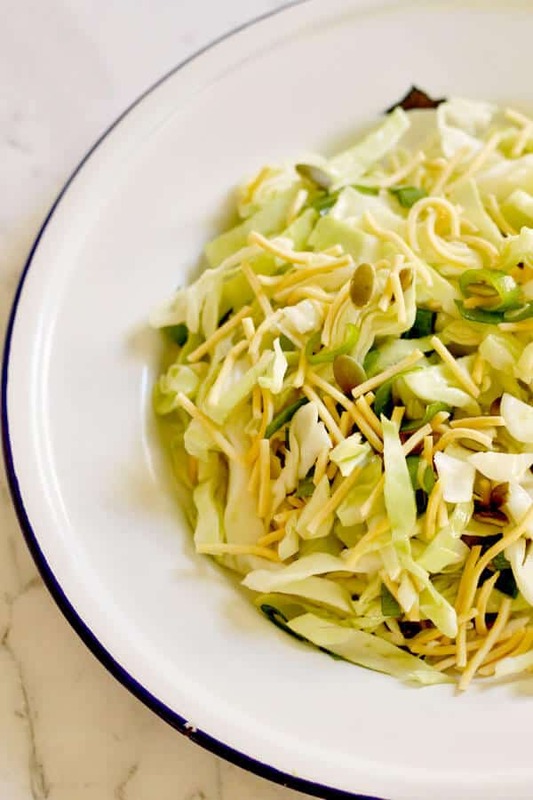 If you’ve tried this Cabbage and Crunchy Noodle Salad I’d love to hear how you enjoyed it! Pop a comment and a star rating below! You can also FOLLOW ME on FACEBOOK, INSTAGRAM and PINTEREST to keep up to date with more delicious recipes. 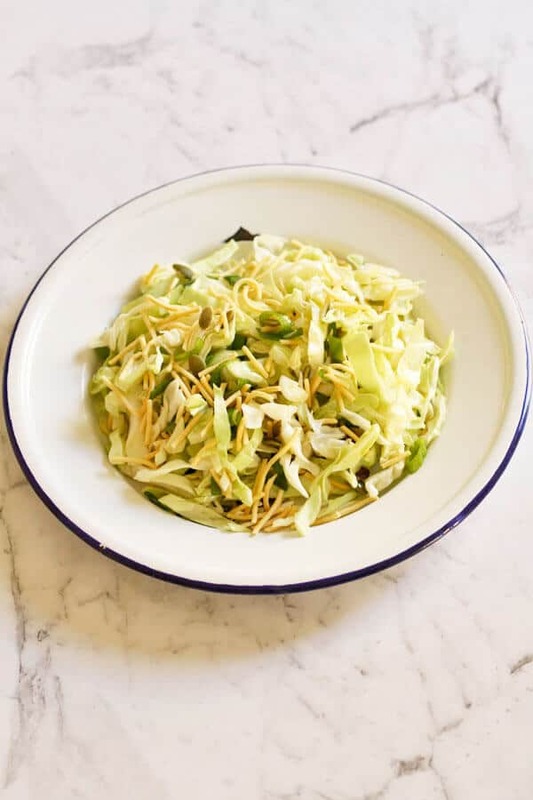 This Cabbage and Crunchy Noodle Salad with Oriental Style Dressing is a much-loved Aussie dish. It's a real crowd pleaser and perfect for sharing at BBQs and potlucks. Place dressing ingredients into a small saucepan. Stir over low heat until the sugar dissolves. Remove from heat and allow to cool. 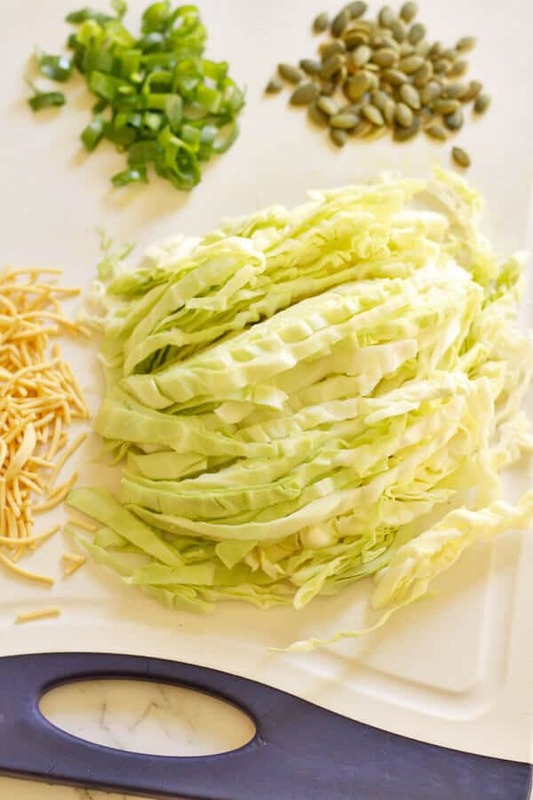 Combine the shredded cabbage, chopped green onions and pepitas in a large salad bowl. Add dressing and noodles and lightly toss to combine. Serve immediately. Crispy Noodles - If you can't get your hands on a packet of Chang's Fried Noodles, substitute for uncooked ramen. Nuts - I love this salad with pepitas but you could easily substitute for slivered almonds or pine nuts. Caster Sugar - I've discovered caster sugar isn't commonly found in the US. You can use granulated sugar as a substitute, or make your own. Make Ahead - If you're planning on taking this salad to a party, leave the noodles and dressing out and mix together just before serving. Nutrition - Nutritional information is a rough estimate based on one serve. It’s such a classic, isn’t it!